DO YOU HAVE THE RIGHT DOCK LEVELER? Creating safe and efficient bridges between facilities and the trucks and trailers that pull up to them is no easy task. With so many different kinds of dock levelers available today, in such a wide variety of sizes, shapes, and mounting styles, choosing the right one can be more complicated than ever. The reason there are so many choices in dock levelers is that there is such a huge variety of freight, vehicles, frequency of use, and loading conditions. These different operations place different demands on a dock leveler, so it is important to make sure that the leveler you recommend matches the individual requirements. Call now (651) 683-0307 to talk with a specialist about all of your dock area needs. These levelers are mounted to the outside of the face of the loading dock. As such, they're the most economical and typically the easiest levelers to install. Their drawback is limited size and weight capacities. These docks offer greater capacities and options to suit more demanding cross-docking applications. Because of more space above and below the leveler, pit-mounted levelers typically have greater working and service ranges and adaptability over edge-of-dock levelers. This type is recommended most for food and other applications where temperature and environmental control is a concern. They're better at keeping the elements and pests out and the temperature in. Your first choice when quoting LEED certified projects. The Blue Giant U-Series vertical storing dock leveler is the perfect loading dock solution for facilities and applications that require strict climate control or high cleanliness levels. It improves internal temperature control, reduces the risk of door damage, and minimizes debris entry. 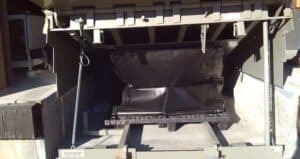 Trailers typically back into the specially designed loading dock bay before the doors are opened allowing for contamination, a complete seal is formed between trailer and inside the facility. Our new design allows for precision control for accurate dock positioning. Blue Giant Smart Float technology allows the dock to match the trailer movement during loading. Companies actually lose one ton of refrigerate air per dock door per year, on average, when they use pit levelers instead of vertical dock levelers. The concept of 'drive–thru' applications where the added efficiency, and virtually no loss of refrigeration is appealing. The trailer backs directly to the loading dock and the trailer doors are opened into the building rather than the traditional opening of the doors prior to fully backing into the position. Dock Lift Needs Service? Fill in the request form and we'll contact you shortly to review your scheduling options.